It seems like no matter what I do, no matter how much I clean, I always find a few dust or lint pieces in my fondant... especially my white fondant! Dust is in the air and sometimes you just can't avoid the pieces falling from the air and landing on your beautiful cake, or worse, landing on your work surface and working its way into your fondant. Well, I'm going to show you what I do to help prevent, or at least drastically reduce, the amount of dust in or on your fondant. 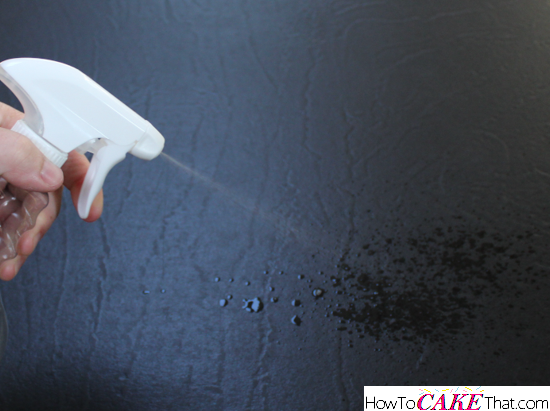 And also share with you a simple trick I figured out to remove the dust that does happen to land on your cake. The very first thing I do before I begin working on my cake is to dress myself in lint-free clothing. My clothing of choice is always microfiber workout gear. 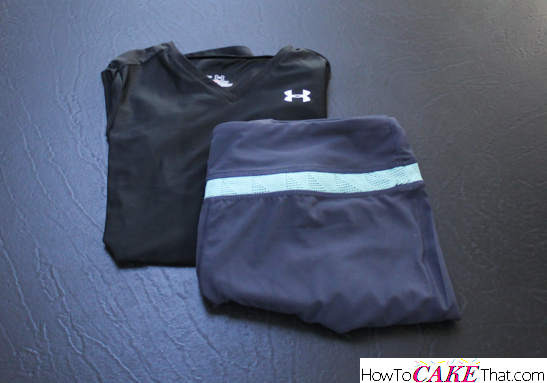 It's comfortable, and I can confidently work with white fondant even while wearing a black shirt! Next, I spray down my work surface with a kitchen countertop cleaner. Then, I wipe the area clean and dry with a lint-free kitchen cloth or paper towels. Next, I knead a scrap piece of white fondant to make it sticky. Then, using light pressure, I wipe down all of my fondant tools I will be using to remove the dust (rolling pin, fondant smoother, etc). 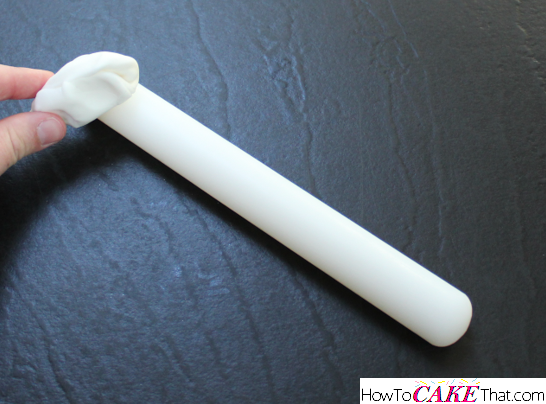 Be sure to use light pressure; pressing too hard will make the fondant stick to your tools. The sticky fondant will grab any dot of dust that is on your tools. If the scrap piece of fondant is very dusty, toss it and grab a new piece. 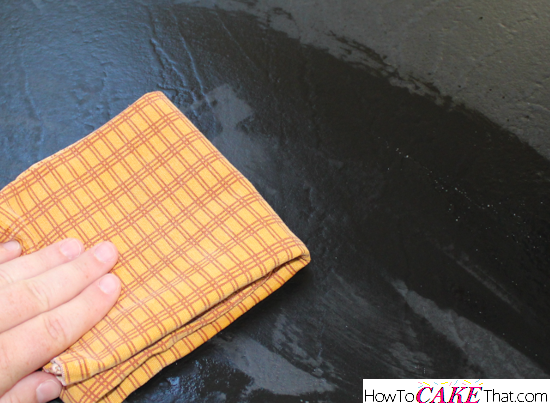 If there are only a couple of dots of dust, knead it once more and then wipe over your entire work surface. You'll be surprised at what this fondant will pick up! 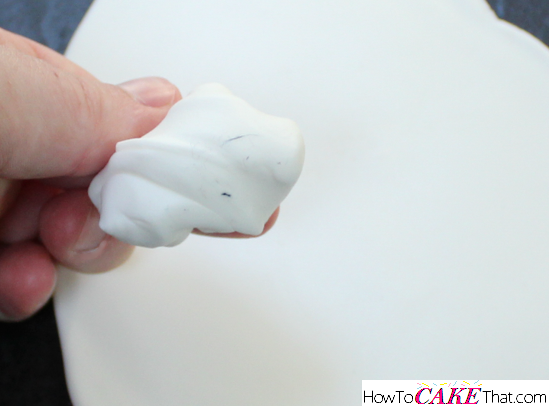 To demonstrate how to clean off any dust that has landed on your fondant covered cake, I've rolled out a bit of white fondant on my work surface. Surprisingly, after taking the above steps my fondant didn't have one speck of visible dust on it! So I plucked some lint from a dark colored kitchen towel and sprinkled it over the fondant. 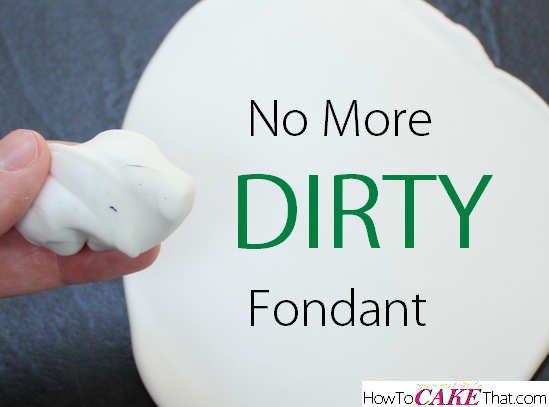 Next, I kneaded a fresh piece of scrap fondant (you'll want to use the same color as the fondant on your cake), and gently wiped it over the surface of my dusty fondant. 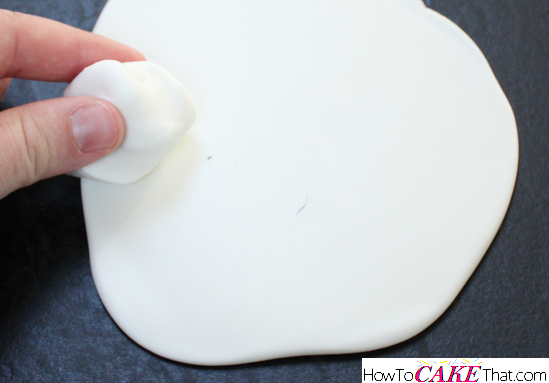 Be sure to keep your kneaded fondant moving or it will want to stick to your cake! If you stop and hold the fondant scrap on the cake it will stick! 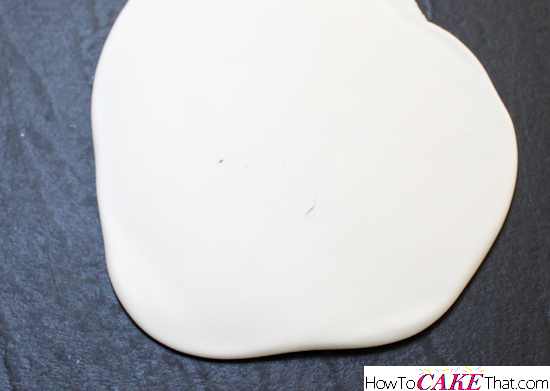 Also, until you get the feel of how much pressure to apply, start wiping your fondant on an area that will not be seen to ensure you won't mess up the fondant on your cake. Check that out!! It's like a lint roller for a cake!! And of course, you may end up with pieces of dust that have worked their way into your fondant. If that happens, just use a long quilting pin to dig the pieces of dust out of your fondant. 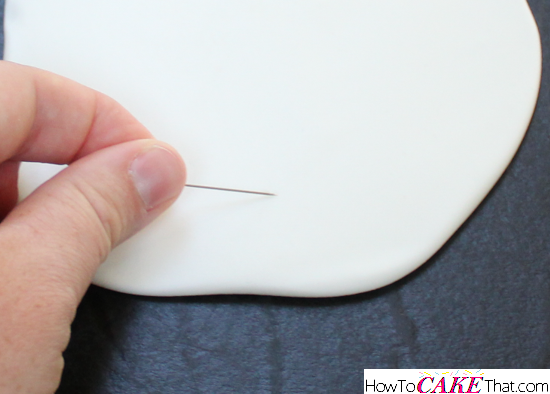 Do this carefully so you don't leave a big mark in your fondant. After you remove the dust, lightly buff over the area with your finger to try to blend any little marks.